A LORRY driver has made his final journey on a low loader truck. Family, friends and former colleagues of Barry Tarn formed a convoy to say a final farewell on Monday afternoon. The 70-year-old, who had been suffering from cancer, was taken from his home, in Trimdon Village, near Sedgefield, for a service at Wear Valley Crematorium at Coundon, near Bishop Auckland. Celebrant Gary Groom, who led the service, said: “Barry was kind-hearted, he called ‘a spade a spade’ and would do anything for anyone if he could. “You always knew where you stood with Barry and what he was thinking. He was very plain talking. “Barry adored his family and they all loved him so very much in return. Mr Tarn, who worked as a trucker for over 40 years, was married to Ursula, before she died in April 2017. The couple had two children, Steven, 40, and Kirsty, 42, and five grandchildren. When his children were young the family had enjoyed caravette holidays in Scotland, trips to Butlins and spent time going to family events. Mr Tarn died on December 20 after his diagnosis with pancreatic cancer last September. His son, Steven, a site manager for a construction company, said the region’s truckers came together to pay their respects to his father. He said: “He arranged it all and had a lot friends who are still HGV drivers, although he retired seven or eight years ago. 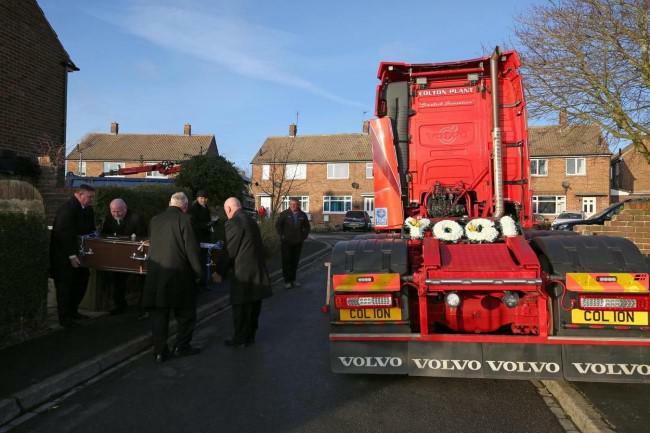 Mr Tarn’s body was brought into the crematorium to the theme tune from Convoy, with Amazing Grace played during the service, while the final piece of music was Ernie (The Fastest Milkman in the West). His son added: “That was what had asked for. “He wanted to set it up as more of a celebration than a depressing day.